Please refer to our stock # FA0003 when inquiring. Wonderful vintage ladies handbag from the 30's - 40's with Graceline Original label. 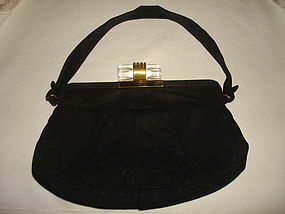 It is made of a black satin material and it is lined with green satin and comes with it's original green satin purse. It is in fine condition but does have a tiny wear spot on the strap where it attaches to one side of the handbag. It features a super large carved Lucite and brass deco clasp!!! Excluding the fabric strap this handbag measures 7 5/8" high x 11" wide. This handbag can still be use for stepping out on that special occasion or hung for display!! !